Lou Bendrick - » But I’m A Whole Foods Mommy! Turns out that I’m more smug than a Prius driver. I assumed that my pantry wouldn’t be filled with too much crap because, hey, I shop at Whole Foods! I’m a kombucha drinker! I meditate! You know exactly where this is going. The bigger they are, the harder they fall and I’m bleeding from the ears on impact. Perhaps a previous head injury explains why I purchased so many processed, sugar-filled items shown in the “pantry cleanout” photo below. A couple items were no surprise. The Honey Nut Cheerios in the upper right? What can I say— the flesh is weak. And anybody smarter than a chicken knows that condiments like ketchup are cloyingly sweet for a reason. But the soups? And et tu, panko? And then there’s the Whole Paws (Whole Foods brand) dog treats shown on the lower left. Sucker! 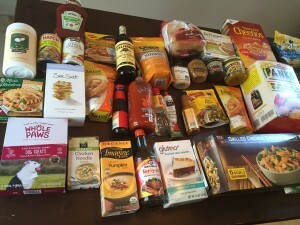 My pantry cleanout included sugar-laden stuff like bread crumbs, soups and … dog treats. Yeah, I’m the idiot who bought them for my dog’s Christmas stocking. Yeah, the box says “glucosamine creme treats/peanut butter and molasses flavor.” But the third ingredient is cane sugar and the fourth is cane molasses. They’re canine sugar bombs.